Who would have thought that layering was still possible for the middle of December? 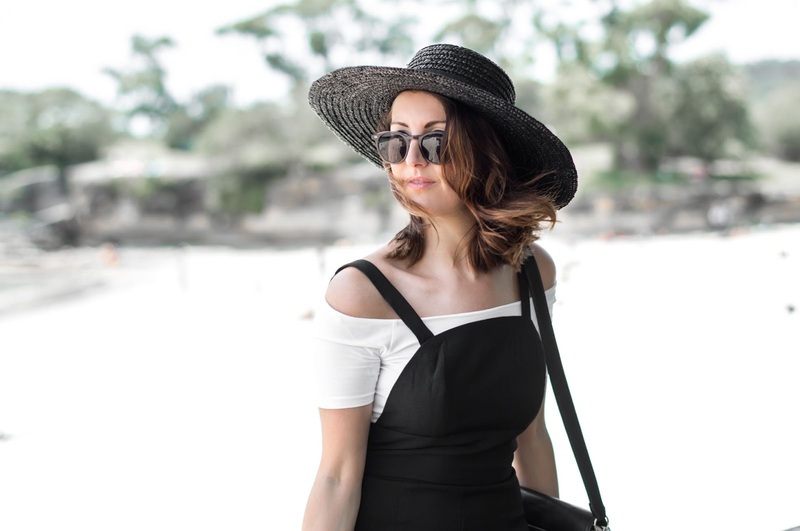 That probably sounds like a crazy line to you readers Northern Hemisphere, but for a stifling Sydney I was pleasantly surprised when styling this look a couple of weeks back. 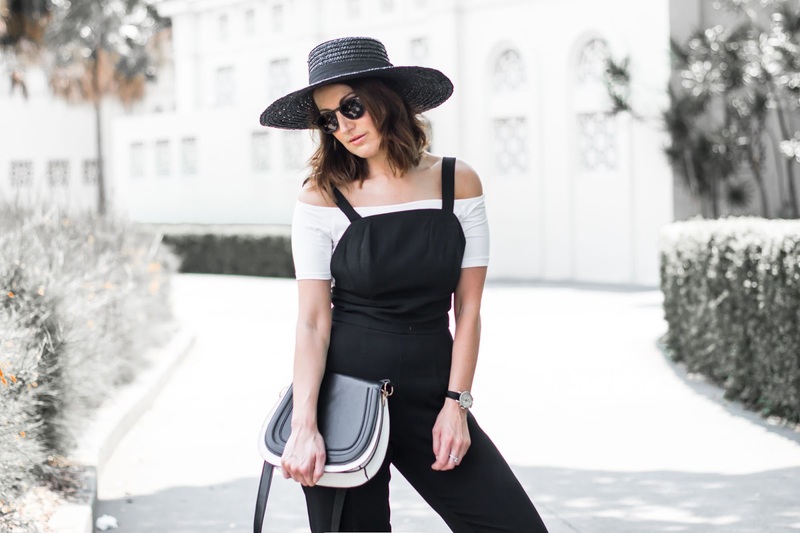 A black jumpsuit in summer is still doable, it just means you have to be smart checking the fabrics to make sure they are breathable. The detailing on this one is impeccable, with the open back and split ankles it's made for the warmer months whilst staying structured. 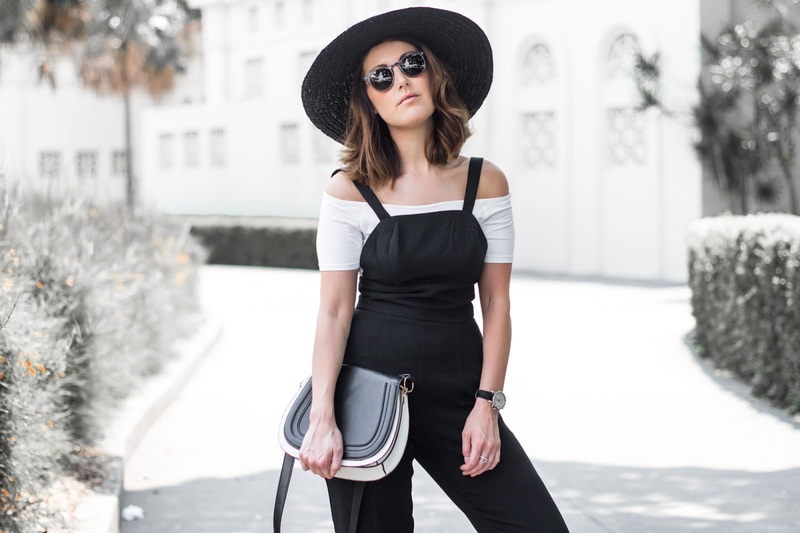 Off-shoulder is still a big hitter this month, and seemed a perfect accompaniment to make a comfortable, yet stylish monochrome daytime look. 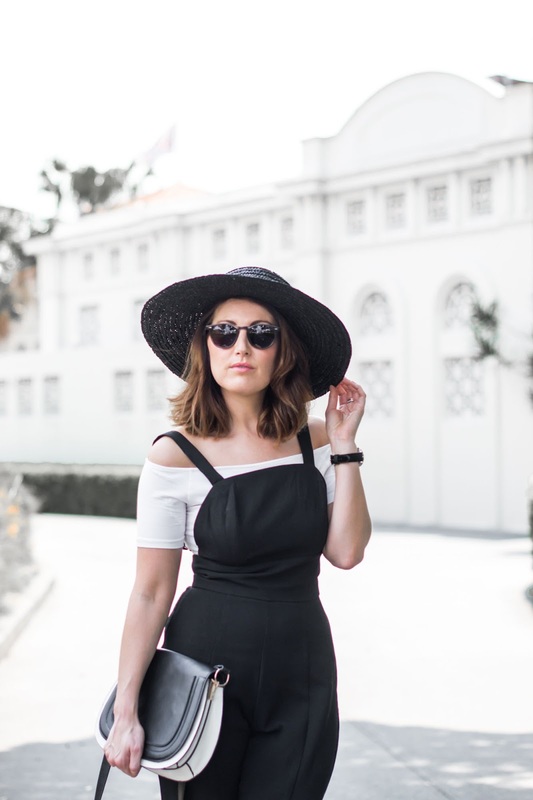 I don’t wear flats in the majority of my blogposts, but wanted to keep the look a more relaxed one; especially when adding the straw wide brim hat. Don’t you just love swapping the felt variety for something more resort and coastal this time of year? So far, I think I’m doing better for summer styling than I did last year. I’ll put that down to finding my true style earlier this year, and not steering away from it regardless of the weather. I used to perceive as Australia as a denim cutoff boho loving country, which I was fully getting into last summer. This year, I’ve decided to pull my winter wardrobe through to the warmer months swapping out the heavier pieces for lighter fabrics and it’s going well. I still love boho inspired raw looking pieces, but trying to channel that more in my accessories. It’s a great mix, and takes me from the office Monday-Friday onto the beach or destination for the weekends. My wardrobe is slowly becoming more wearable for all occasions. Would love to know how you are changing up your wardrobe coming into the New Year. Stay tuned for a few more style posts and a couple of special ‘Boho Behind The Lens’ shoots that I can’t wait to share with you guys. It’ll be Christmas before we all know it!